Construction started in 1918 and Speedway students first attended this modern consolidatd grade school in 1919. The first Speedway basketball team (eighth grade) was created that year. The school site and bulding were subsequently acquired from Wayne Township by annexation of territory. 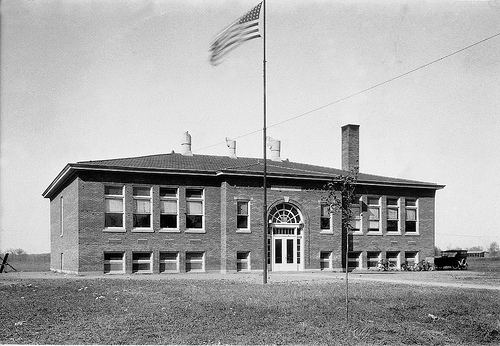 Four new classrooms and other needed facilities were added in 1929. Mr. Lincoln Northcott was the Principal at the time the Class of '64 was there. 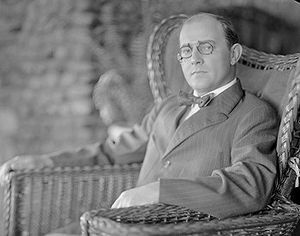 In her book "Fabulous Hoosier," Jane Fisher wrote of her ex-husband, Carl Fisher: "I don't believe he even thought in terms of money.... He often said, 'I just like to see the dirt fly.'" Indeed plenty of dirt flew during his fast-paced life. Before he built Miami Beach, he built racetracks and roadways. His early love of bicycles and automobiles culminated in a desire to create destinations.Born in 1874 in Greensburg, Indiana, Fisher quit school at age 12 and five years later opened a bicycle repair shop in Indianapolis. A successful entrepreneur, Carl made millions in 1909 after he sold his Prest-O-Lite automobile headlamp business to Union Carbide. Carl loved speed and broke a record in 1904, driving an automobile two miles in 2.02 minutes around a track. As much as speed, he loved publicity and gimmicks. In 1911, after his Indianapolis Motor Speedway failed to attract large numbers, he built a 500-mile track and drew more than 80,000 people to a race onlookers described as "the greatest spectacle in sports." Soon Miami Beach caught Fisher's eye. Foreseeing the automobile's impact on American life, he was instrumental in the construction of the first transcontinental highway, the Lincoln Highway, from New York to San Francisco, in 1913. People questioned his next project, the Dixie Highway. What need could there be for a highway running from Indiana through the Deep South and terminating in Miami Beach? Fisher couldn't convince people of the value of Florida real estate. Even when he was literally giving land away in the late teens, he had no takers -- until a president and a pachyderm came along. Gimmicks, which Carl relied on from time to time, would propel Carl Fisher to success. Carl had acquired a baby elephant named Rosie who was a favorite with newspaper photographers. In 1921 a picture of Rosie as a "golf caddy" for vacationing President-elect Warren Harding "fixed Miami Beach in the public's mind as a place you had to see to believe." Publicity stunts worked; the population ballooned some 440 percent from 1920 to 1925. At the height of the '25 land boom, Carl Fisher's fortune was estimated at $50 to $100 million. Ever restless, he decided to build a northern Miami Beach at the tip of Long Island. He envisioned Montauk as a Miami for the summer, but it was doomed. In the wake of Fisher's southern success, the resort market had become saturated. Carl Fisher's downward spiral began in 1926. He and Jane divorced after 17 years of marriage. The boom leveled off, and Miami Beach began to experience a backlash in the northern press, which regularly ran stories on shady land deals and charlatans. Nature had its own plans for Miami Beach. In September, a major hurricane slammed into the city. Structural damage was terrific; 113 people were killed in Greater Miami. The storm generated still more negative publicity for Miami Beach, and tourism dropped in 1927. The following year the city rebounded somewhat, but the boom was gone for good. Carl Fisher couldn't rebound. He had borrowed against his Miami Beach properties to build Montauk, which was completed in time for the stock market crash. By then Miami Beach couldn't get him out of his hole. When the Great Depression hit, tourism -- and Fisher's fortune -- dried up. The Pancoasts, Fisher's former partners in the Miami Beach Improvement Company, offered the entrepreneur a salaried position. He took it, fruitlessly dedicating himself to reviving Miami Beach's reputation. Shortly before his death, Carl built Key Largo's Caribbean Club, a fishing club for men of modest means, "a poor man's retreat." It became a gambling establishment after he died. The self-made Fisher had become self-destructive. During Prohibition Carl was drinking heavily and was bootlegging. Transporting alcohol was a challenge, but drinking it became an addiction that would cost him his life. By 1938 Carl had cirrhosis. Periodically his body had to be drained of excess fluids, up to 20 pounds at a time. Desperately seeking a cure, Fisher consulted a veterinarian who specialized in the liver and lungs of animals. On July 15, 1939, at age 65, Fisher died of a gastric hemorrhage His epitaph in the "Miami Daily News" read: "Carl G. Fisher, who looked at a piece of swampland and visualized the nation's greatest winter playground, died ... in the city of his fulfilled dreams." Carl, however, hadn't looked at Miami Beach as romantically. "Wasn't any goddamned dream at all," he once said. "I could just as easily have started a cattle ranch."